Wow! Nicely upgraded home only 300 yards to the Beach! Sure to impress! Everything is new! Private Pool too! Heat it for $30 per night when necessary. Walk to the beach! Walk to restaurants and bars along the beach too! From the moment you walk in, you'll get the 'WOW' factor! 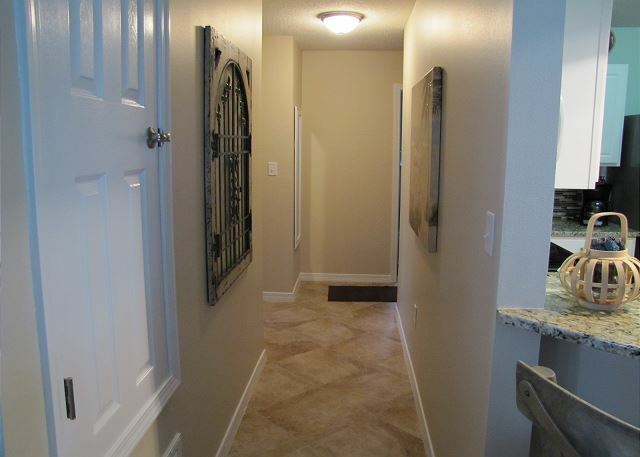 The entry is impressive and you'll have views of the open floor plan seeing all of the front part of the house! 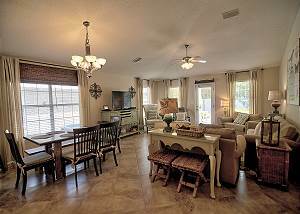 The kitchen, Dining, & Living Room are all open to each other allowing everyone to be in the same room at the same time! Enjoy your time together and make wonderful memories here! 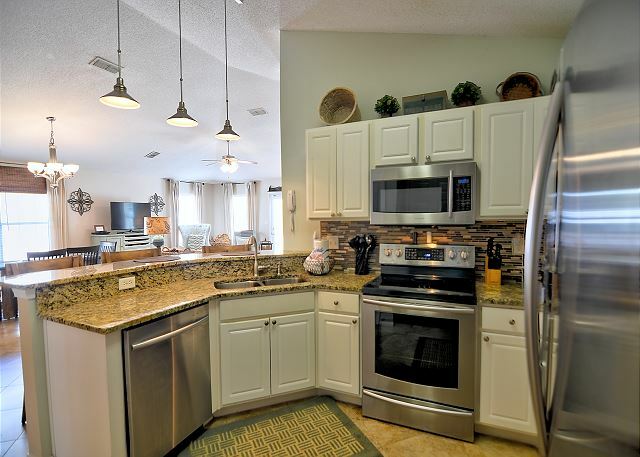 The kitchen has updated stainless steel appliances, granite counters, and an awesome view of the living room and dining area! 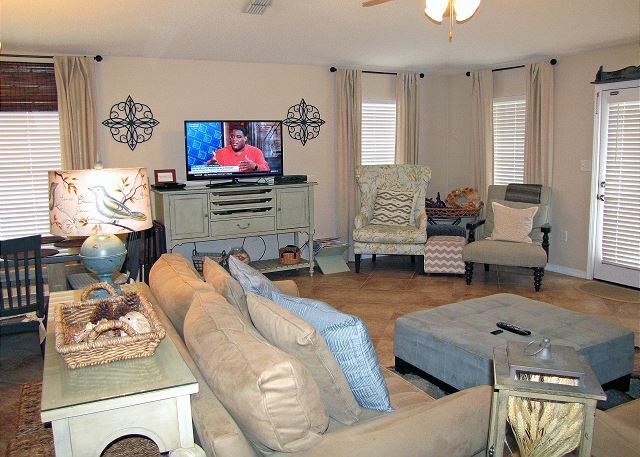 Watch TV with the group while preparing dinner or making your favorite drink! 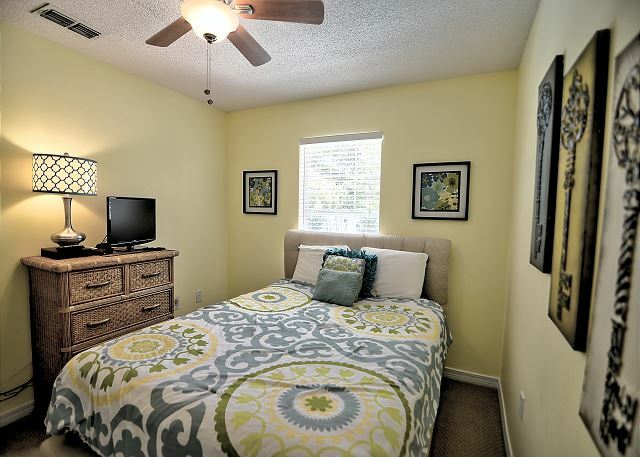 You'll have all the comforts of home! 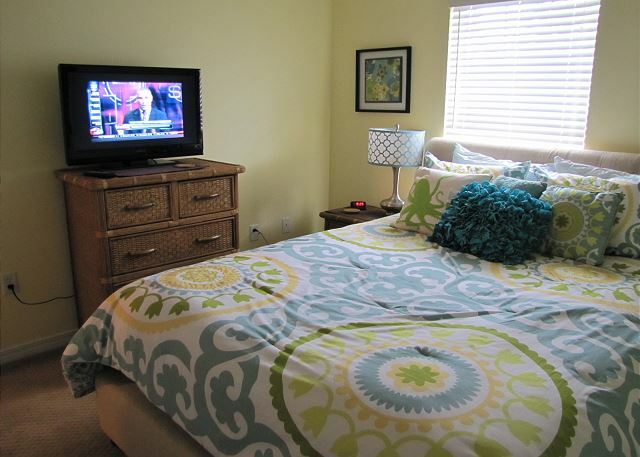 Recently added flat screen TVs and DVD players in every room! 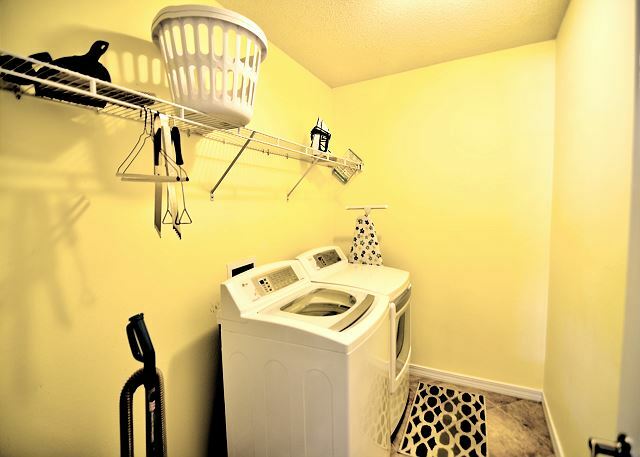 Full size washer & dryer just off the kitchen. 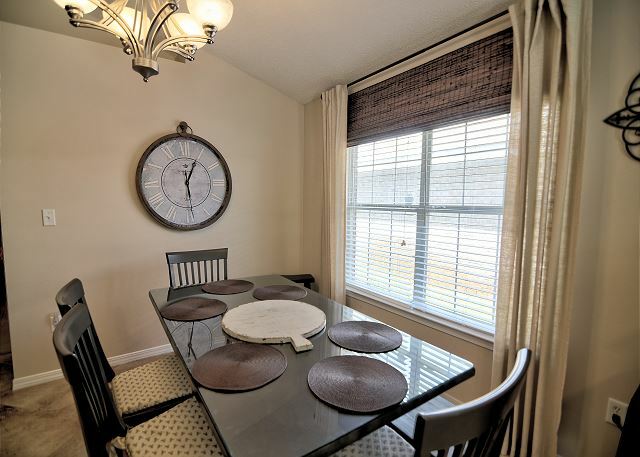 The dining table has plenty of room for everyone! 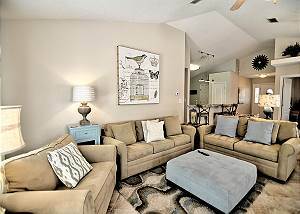 The living room is big and comfortable! There is a sleeper sofa and a sleeper chair for extra sleeping, ideal for children! The private pool can be seen from inside the house and is big and inviting! 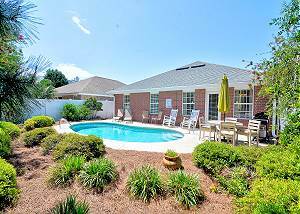 Lots of room in and around the pool for sunning, swimming, & playing! Propane BBQ grill next to the pool. You may need to exchange the tank while you are here. Lots of nice patio furniture around the pool too! 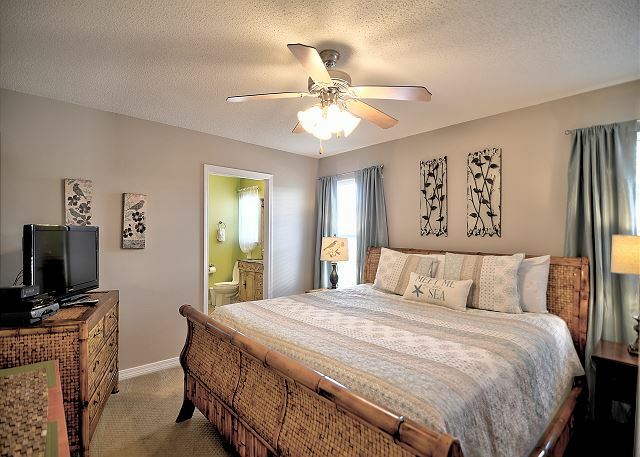 The Master Bedroom is off to the left from the entry and separate from the Hall bedrooms! It has a king bed, 32' LCD TV with a High Def box, and its own private bathroom! 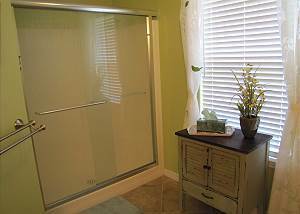 Upgraded vanity and a double size walk-in shower in the ensuite bathroom! The other bedrooms are on the other side of the house down the hall. 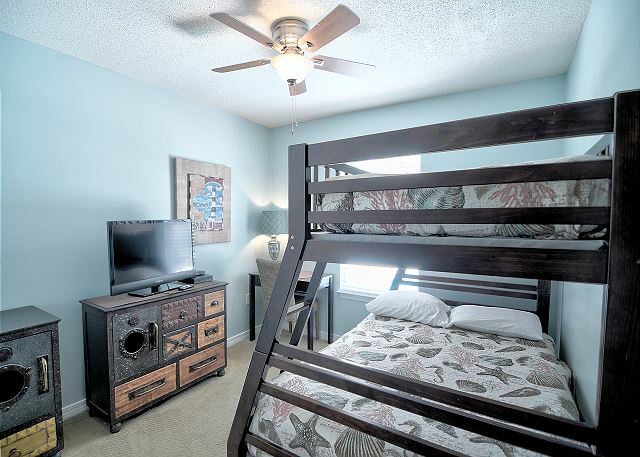 You'll find a Queen Bedroom with its own 32' LCD TV and a Bunk Room with its own TV too! 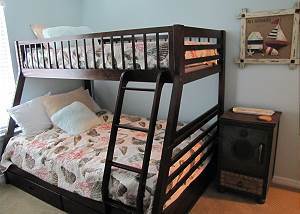 There is a full size bed on the bottom and a twin on top. These beds are designed with children in mind and would make a great kid's room! 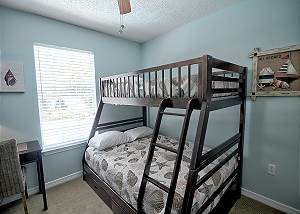 There is also a Queen Sleeper Sofa and a Single Sleeper Chair in the living room designed for kids too! The hall bath has an upgraded vanity and toilet too! 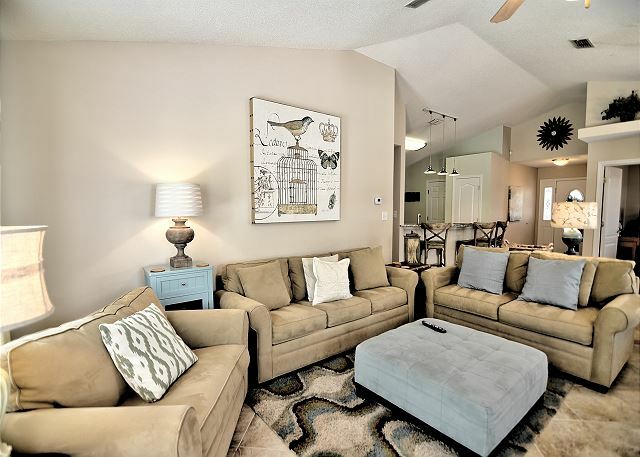 Nice upgrades and a warm soothing decor make this home a great value and the best place to spend your vacation in Destin! The neighborhood is gated, private, and quiet! 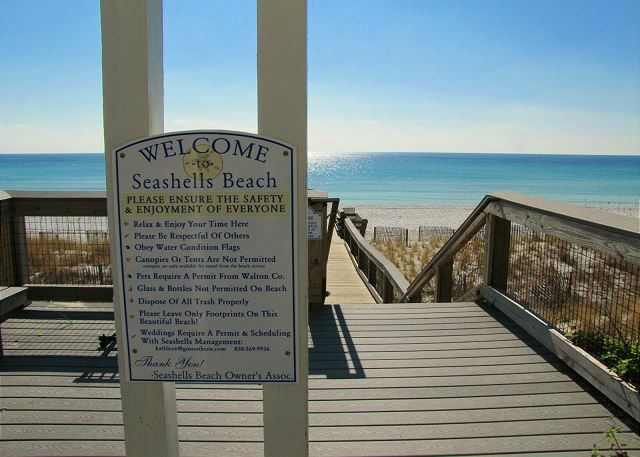 Walk to the beach and several Restaurants & Bars along the beach! 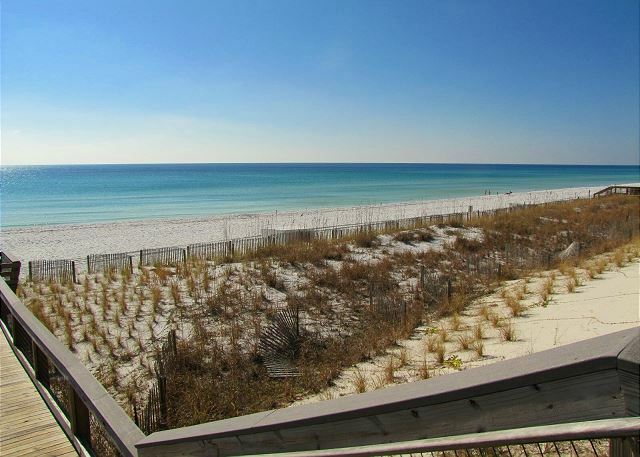 Great Beach living! 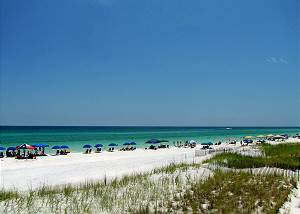 Close to all Destin Activities too! You'll come once and want to come again and again! FREE Wireless high speed internet is provided! 30% required to reserve. The balance is due 30 days in advance. Fully refundable if canceled more than 60 days in advance minus $150 fee. Trip cancellation insurance is offered at 6.5% of the total for covered cancellations within 60 days through CSA Travel Protection. 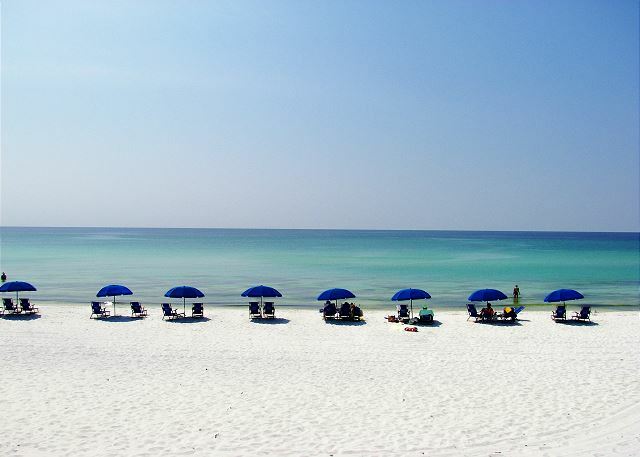 The Destin area is known as the Luckiest Fishing Village in the World! Deep sea fishing is very popular in the region. 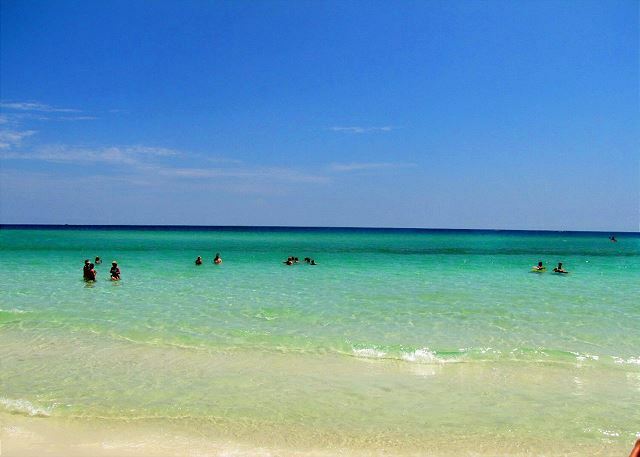 The sugary white beaches and the clear, sometimes Emerald Green waters give true meaning to the word, 'Paradise!' 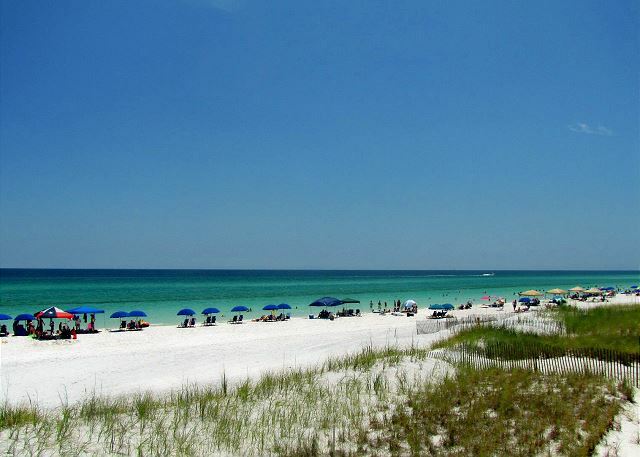 Destin is abundant with restaurants, bars, shopping areas, golf, and water sports. 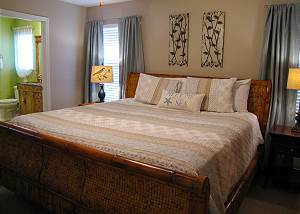 Vacationing here is an annual, sometimes two to three times a year event for many families! You should come too! When you come once, you'll want to come again and again! 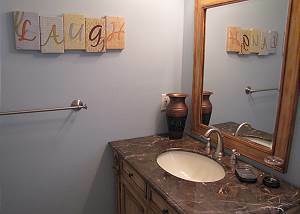 Some people make this area home after just one visit! Come see why! 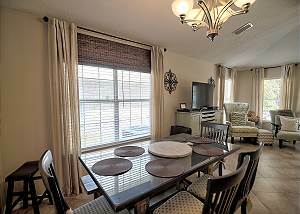 Guest Reviews of 3br/2ba with private pool! 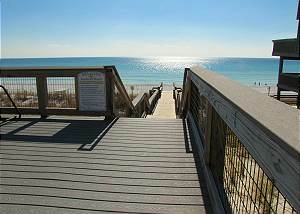 walk to the beach! upscale & nice! sleeps 7! 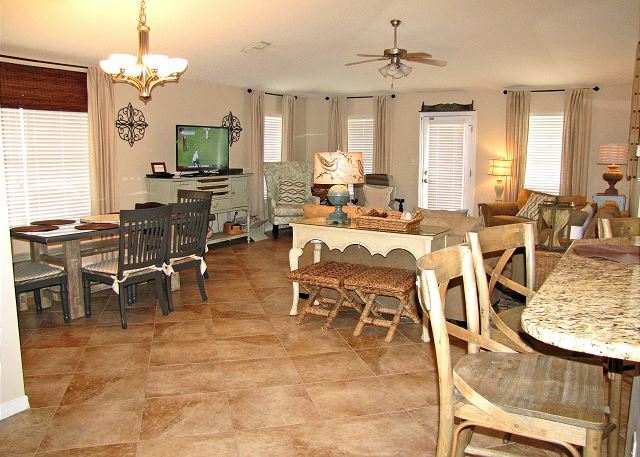 This patio home was a great fit for our family and a nice place to vacation with our adult children. Very conveniently located with short walk to the beach, sidewalks for bike riding, and easy access to stores and restaurants. The house was not only nicely decorated and stocked indoors it was beautifully landscaped. 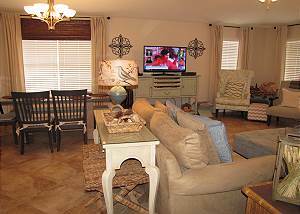 The rental agency was wonderful to work with, responsive, and professional. Hello Kimberly, Thank you for the perfect 5 star review! 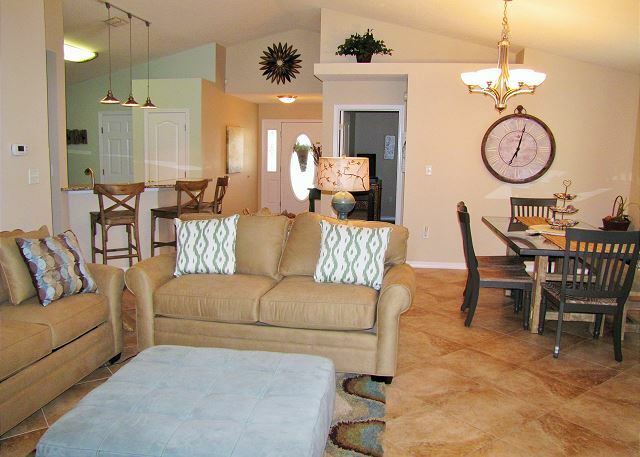 We're happy to hear you enjoyed your stay at Cones Cove and found it to be convenient to many things. 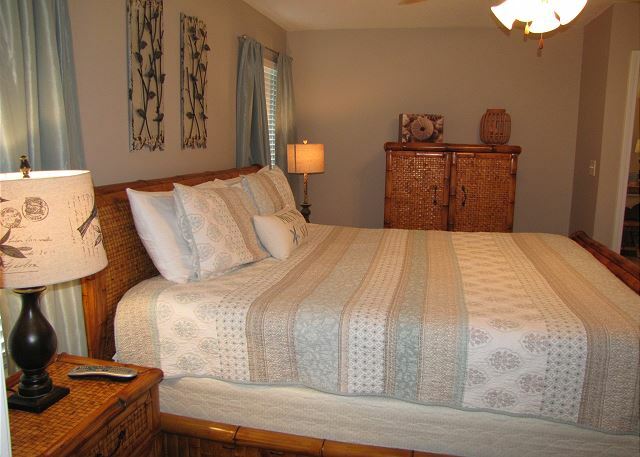 This is one of our favorite homes in Paradise Retreat and we always enjoy receiving feedback on our guests' stay. Hope you'll come back and stay with us again next fall. Everything was perfect - very pretty home with nice furnishings with a close walk to the beach - Terry and staff were very accommodating! 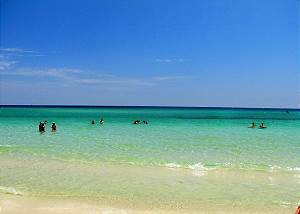 We will definitely check with Crystal Waters for our next trip to Destin. Hello Howard family, What a nice review you left of your stay! We love hearing that our guests enjoyed their stay and will definitely be back! Hope to see you soon! the home was perfect! The walk to the beach was short, and having the pool in the backyard was wonderful! the home was clean upon arrival. The garage was filled with beach toys, chairs, umbrella and a wagon to bring it all to the beach. This saved us from having to rent beach chairs for the week. We will be staying here again. check in and out was easy and quick. Hi Misty, Thank you for the perfect 5 star review! We're happy to hear you enjoyed your stay at Cones Cove and hope you'll return again next summer! My family and I recently stayed at Cones Cove and we really enjoyed it. It was my sister’s first vacation and first visit to Florida. You can’t beat the location of this home, it’s ideally situated near everything you would want to do and see. The house was very clean and comfortable, it was exactly what we expected. The pool size was perfect. And the management company made booking the reservation very easy. 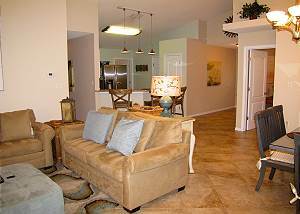 My sister was very pleased and would love to return and stay at this property. 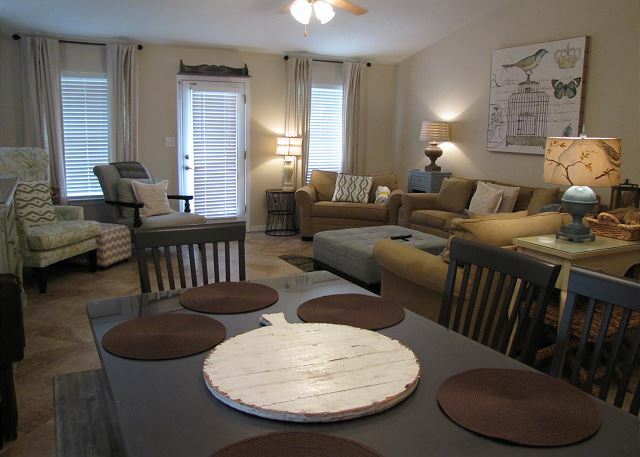 Hello Lee Family, We're happy to hear that Cones Cove was everything you hoped for. We would love for your family to return again next year, if not sooner! Stayed here for a week with my wife and 2 children (3 & 5). 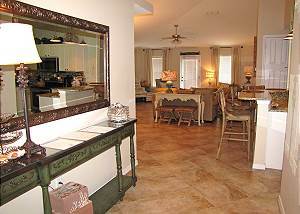 We had a great time and really enjoyed the location (walkable to the beach) and the private pool. Would definitely look to stay here again. Review by Paul and Anja T.
We had a wonderful stay at Cones Cove all around. The house is spacious enough for a family to spread out even on a rainy day. The pool is good size and with the deep end allowed for plenty of fun for our teenage boys. Nice kitchen, great washer/dryer, the master has a nice size bathroom and closet. Nice fixtures everywhere and the night lights were much appreciated. Used the grill a couple of times and the spacious garage with beach cart, chairs, boogey boards and toys was an extra bonus. Plenty of pool toys too! We would definitely come back and recommend it to everyone. Quiet, gated neighborhood. Only 5 minutes to the beautiful beach. House is very clean and not at all damaged or showing wear. Beds were comfortable with plenty of extra bath towels. Lovely home in an easy access location! Wonderful experience! The house was perfect for our family. The kids loved having a pool and we appreciated the quiet neighborhood for an evening walk. The neighbors were also very friendly! 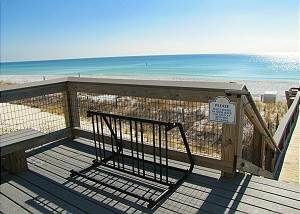 It wasn't too far from the beach and we certainly make good use of the carts and pool/beach accessories! The staff at Crystal Waters were very helpful and friendly. Definitely planning a return! The rental was wonderful. The house was nice and clean and had pretty much everything we needed. Although we brought our own, they had a wagon/chairs/umbrella for the beach. Beach was not far from the house (few minute walk) and the backyard pool was excellent. I plan to rent this house again in the future, thanks again!! My family and I enjoyed our stay at Cones Cove! 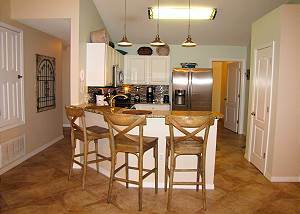 The house was very spacious and clean! 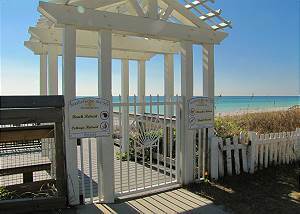 We had everything we need including a short walk to the beach, with private beach access. The kids loved the pool, it was definitely a great bonus! Any questions I had were answered right away! I could not have asked for a better stay! We hope to return next year! Great! Best way to celebrate my victory over cancer with friends and family at this lovely home and beautiful beach. Congratulations and so nice to hear. Glad you enjoyed your stay at Cones Cove! 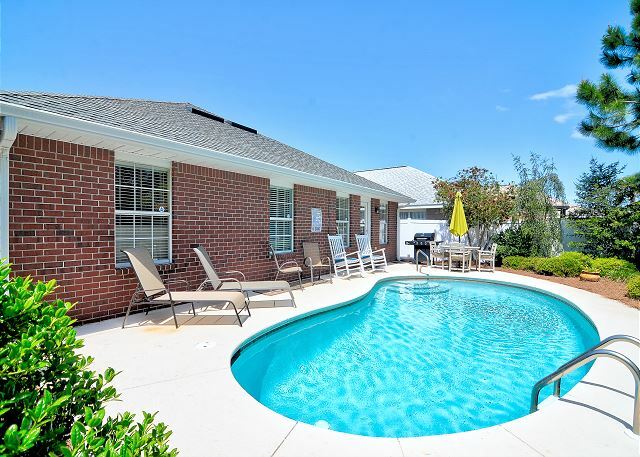 It is a super nice home with a private pool so close to the beach and all activities in Destin! We stayed at Cones Cove with another couple and had a great time! The house was perfect for 2 couples as the couple who got the "queen room" were able to use the bunk room as sort of a walk in closet for suitcases. It would probably work well for a couple with kids and grandparents or a nanny along also. 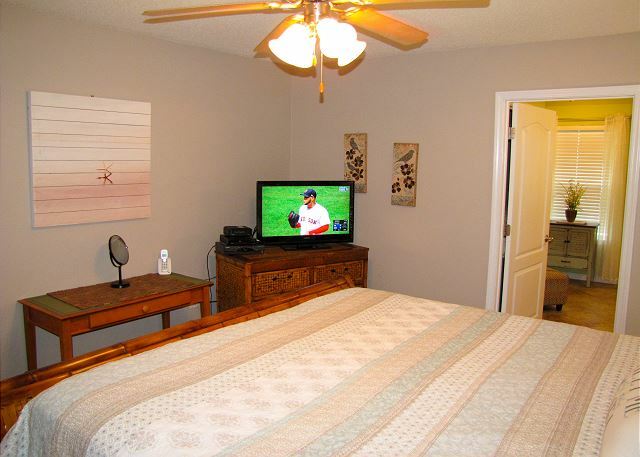 The master is on the opposite side from the other 2 bedrooms which offered us both a bit of privacy. The furnishings are super comfy (especially the big couch). The pool and patio area were fantastic and it was a really easy walk to the beach and a few great bar/restaurants. We had one little issue with the door lock and it was addressed right away. We would absolutely stay here again! Glad you all enjoyed your stay at Cones Cove! 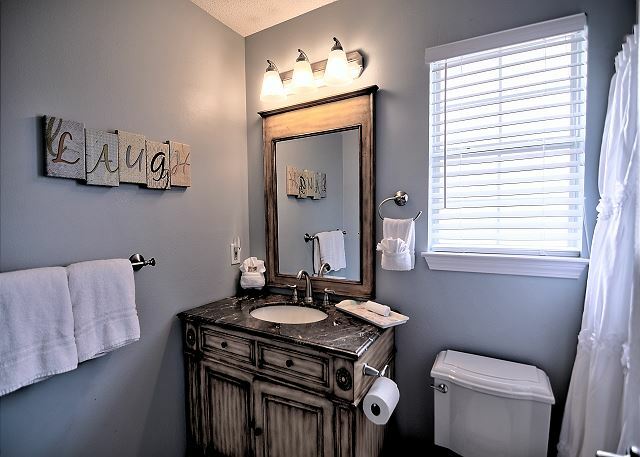 It is a cute and super nice home with loads of extras and upgrades! The private pool and private backyard is so nice! The beach is very close too! My family stayed in Cones Cove during spring break this year. It was an amazing vacation. My girls LOVED the pool and being able to walk to the beach. The house was very spacious and clean. Very quiet neighborhood and everyone was very friendly towards us! Was so close and convenient to many places to eat and shop. Overall I have absolutely no complaints and would return in a heartbeat! So glad you enjoyed your stay at Cones Cove! It is a super nice home in a gated neighborhood with a private pool and close to restaurants and the private beach access! We had a wonderful stay at Cones Cove! The house was really perfect for our family. 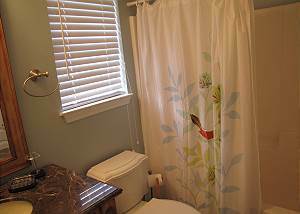 It is spacious, clean, comfortable, and very well supplied. We celebrated Christmas and New Years and the birth of our 2nd Grandchild while we stayed here in Destin. Family members came for a few days and each commented on how much they enjoyed the house!We would walk to the beach regularly and see the sunsets at Pompano Joes! Great memories for us from our stay at Cones Cove! 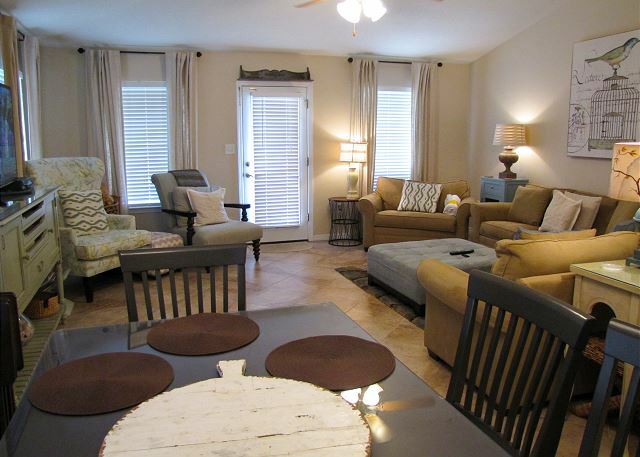 So glad you enjoyed your stay at Cones Cove! 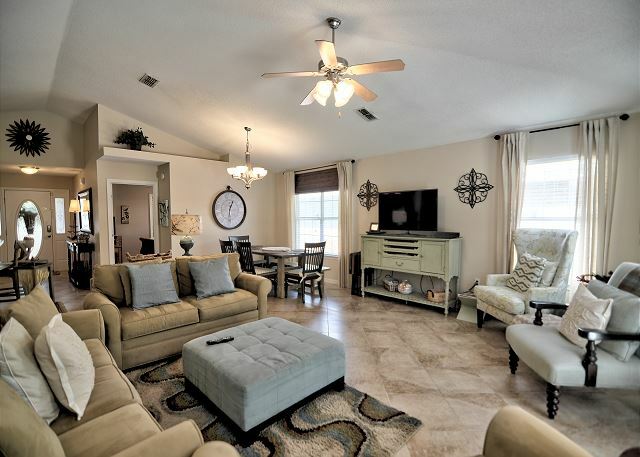 It is a super nice home with upgrades and a private pool very close to the beach! 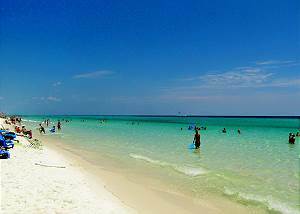 We came to Destin for our first time in July. The house was very clean upon our arrival. The wagon in the garage was a nice surprise to have for the week. It came in handy when taking our child to to and from the beach with all the stuff that you need for the day. The pool was nice to come home to and the back yard was quiet and private.I will say that I think that the shrubs at the walkway may need to be cut back a bit. We had to turn sideways to get past the overgrown greenery. 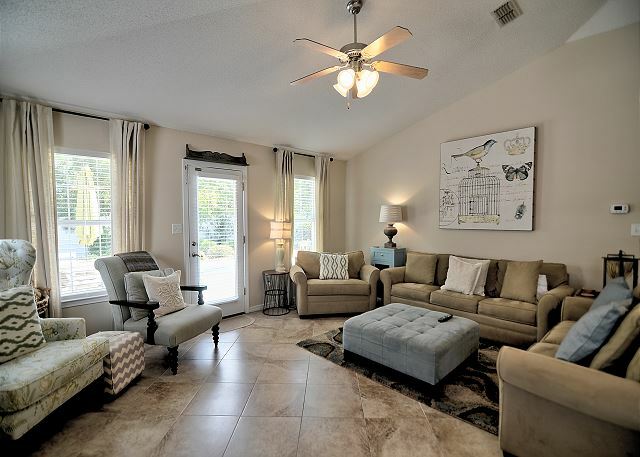 Although it wouldn't make or break another stay, I think that a set of chairs and an umbrella at the beach should be (considered) included in the price of the house. 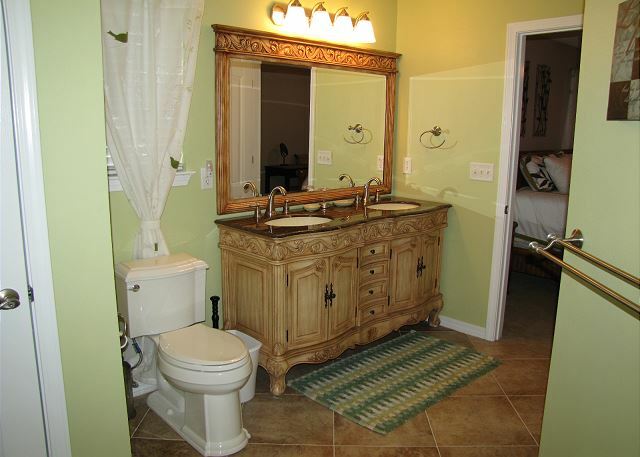 We were kind of surprised to find out that the homeowners didn't include this with the price of the house. 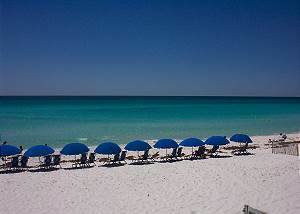 Overall our stay was amazing and we will defiantly be back to Destin in the future. So glad you enjoyed your stay at Cones Cove! It is a super nice home with a private pool close to the beach! Will talk with the landscaper about the shrubs. Beach service is available at the beach for a fee. We would have to increase our prices accordingly to include it in our rates. That could increase weekly rates by about $200 per week! We greatly enjoyed our stay at Cones Cove. It is a quick walk to the beach and is much closer than it looks on the map. The neighborhood was very quiet and being a small gated community there was very limited traffic which was nice when walking with small children. The house is fairly small but suited our needs well. We were staying with two small children and my parents which is max I would suggest. 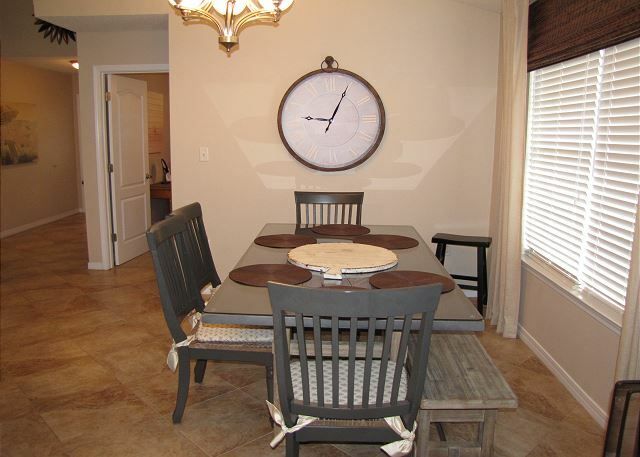 The furnishings and decor were very nice though there was noticeable wear and tear here and there. 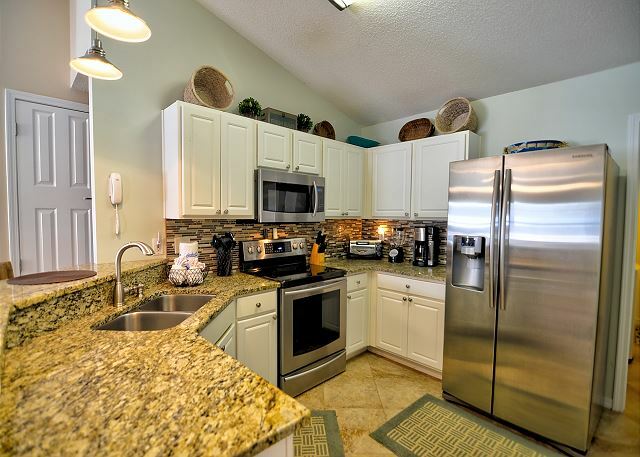 We appreciated the well stocked kitchen and the abundance of bath towels. The pool was the absolute highlight of our trip. Our kids preferred the pool over the beach. The pool was a great size, clean, and the overall backyard was an enjoyable space. 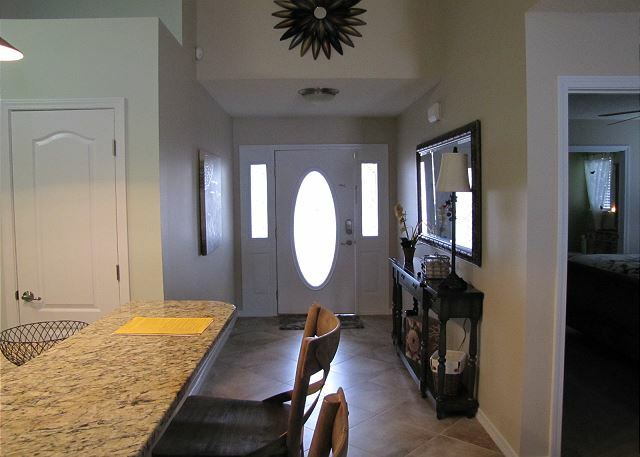 The keyless entry to the home was also a great feature. I would highly recommend this home to others. So glad you enjoyed your stay at Cones Cove! 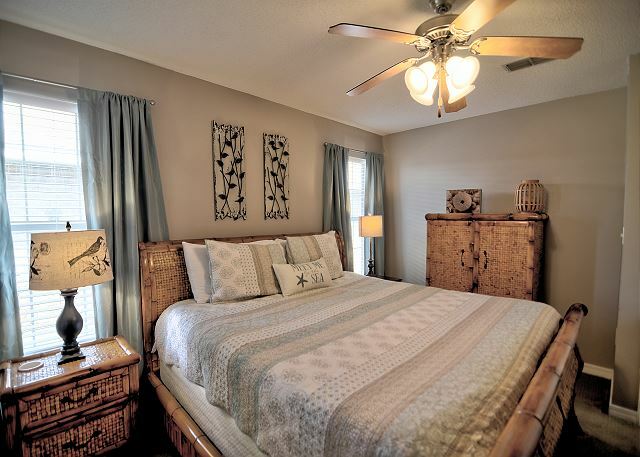 It is a special home with nice furnishings and upgrades! 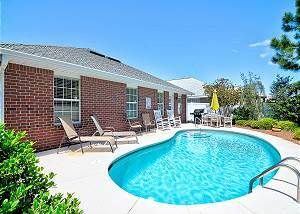 The beach is close and the private pool refreshing! My family and I were very pleased with the beautiful home. Everything from the de core to the pool was perfect. 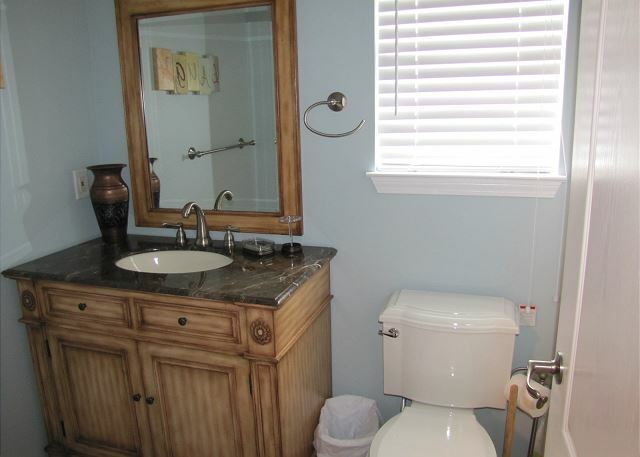 We were impressed with the cleanliness of the home. We had a fantastic time hanging out in the pool area as well as in the home. So glad you enjoyed your stay at Cones Cove! 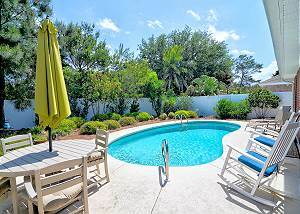 It is truly a nice house close to the beach and the private pool is a bonus! 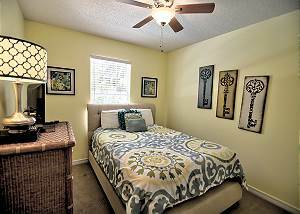 We do our best to keep it clean and comfortable! The house was very clean and perfect for our group of 2 families with youngsters. The kids were able to swim every day thanks to the pool heater. We had a short walk to the beach and loved the fact that there was a wagon to drag all of our belongings with us as well. Would highly recommend this property. So glad you enjoyed your stay at Cones Cove. 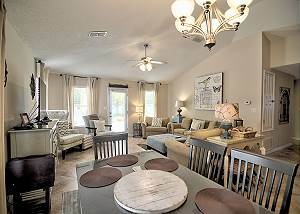 It is a special and very cute home very close to the beach. The private pool is super nice and can be heated when necessary! So glad you enjoyed your stay at Cones Cove! 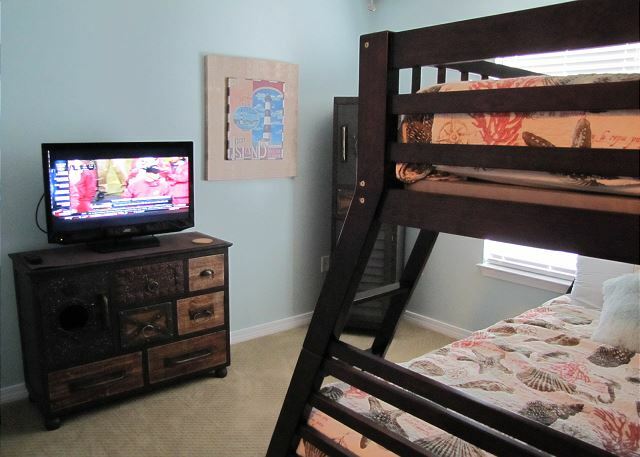 It is truly a special house in a gated neighborhood very close to the beach! The private pool is so refreshing too! This was a great house! We have a family of seven and didn't feel crowded at all. The pool was perfect to keep the kids occupied since the weather wasn't great while we were there. The Property Management company was so easy to work with. Loved this house! So glad you enjoyed your stay at Cones Cove! It is a special home with nice upgrades and a refreshing, private pool! We enjoyed the house and location very much. The pool was very nice also. The walk to the beach was a little longer than we thought it would be but not too far. We would consider staying here again. So glad you enjoyed your stay at Cones Cove! It is a special home with nice upgrades and appointments. The pool is very refreshing too! 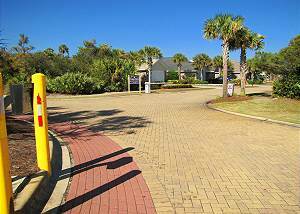 The walk to the private beach access is right at about 1/4 mile, about one time around a high school track. The house was gorgeous and we definitley will be returning next year. My family enjoyed the private pool. Getting to the beach was a lil difficult at first until we learned where entrance was to get on beach. So glad you enjoyed your stay at Cones Cove! 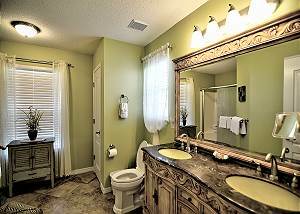 It is a super special, well appointed home with nice upgrades. 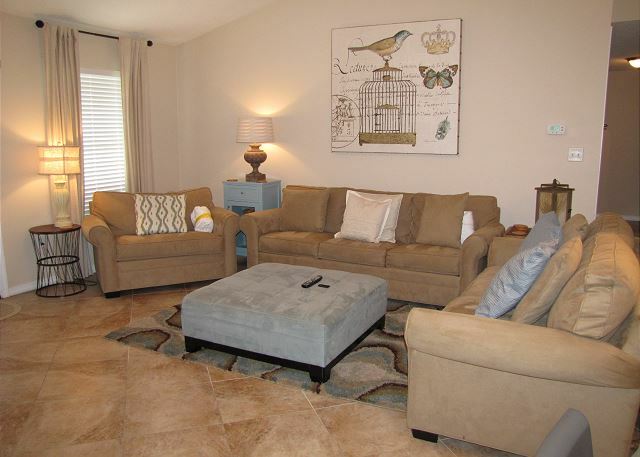 Great location in a gated neighborhood and very close to the private beach access! The private pool is very refreshing! This house had everything we wanted for a perfect relaxing stay. 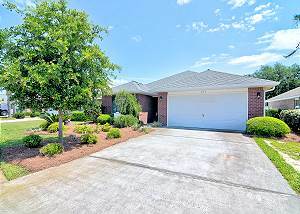 Property is spacious and very well appointed for a single family occupation. 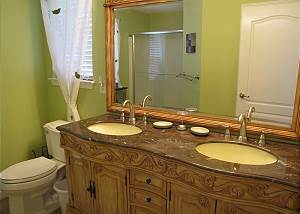 It is cleaned and maintained to an exceptional standard. The pool was wonderful to come home to after a visit to the beach. I particularly liked how quiet and private it was at the same time as being so close to the beach. The only thing I think was a slight disadvantage was the lack of remote control to operate the subdvision gate and the garage. Wasnt too much of a problem as the weather was always good but could have been if raining hard. Cant wait to come back. So glad you enjoyed your stay at Cones Cove! 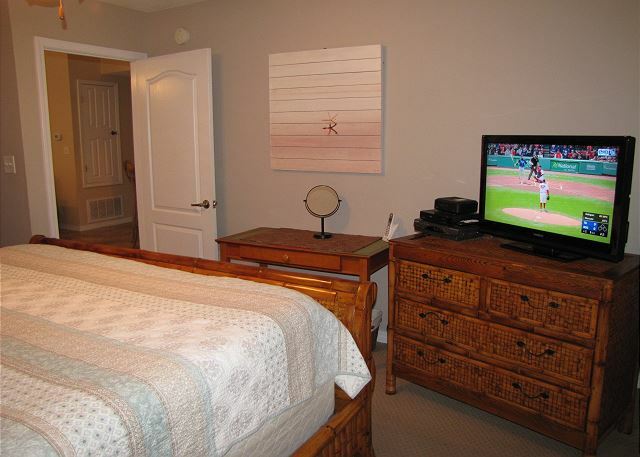 It is a special home in a gated neighborhood very close to the private beach access. It is well furnished and well kept. The private pool is a bonus! There is a key pad for the gates to the neighborhood. Remotes tend to disappear and are so hard to keep around! Loved this house! Beautifully decorated and spacious, we felt truly at home. The walk to the beach was short and sweet (easily doable with 3 kids). Neighborhood was safe and quaint, quiet but active. The pool was a perfect retreat from the hot beach and a great alternative if you have some non-beach goers (we did). Only minor issue is the bedrooms don't have curtains that block the sun. So if you are someone who doesn't like sunrise waking you up, I would recommend packing a set of curtains from home. Another plus was everyone from Crystal Waters were super pleasant and helpful. Already looking forward to staying here again next year! So happy you enjoyed your stay at Cones Cove! It is well kept and nicely decorated. We do our best to keep it comfortable for everyone! The beach is very close and the private pool, very refreshing! 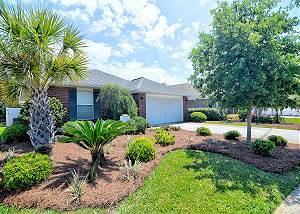 The house is in a very nice and quiet subdivision in Miramar Beach. From the outside the house looks small, but the floor plan is open and bright. I would say only big enough for 1 family unless you like to be squeezed in like sardines. We had 5 people and were very comfortable. The pool is nice to come back to after a day at the beach. It is not very large and I would say the only drawback is that the pool deck is very small because the garden takes up most of the yard. The only negative aspect to me would be the grill. It is very cheap and will destroy your fresh catch if not careful. Would prefer a charcoal grill, but that is personal preference. All in all a very nice place. We would definitely consider going back. So glad you enjoyed your stay at Cones Cove! 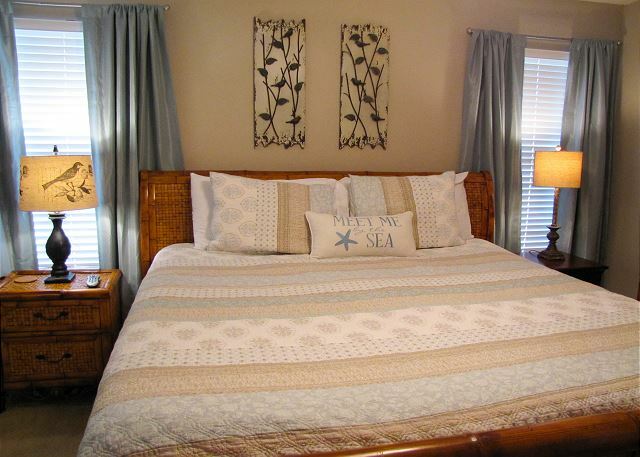 It is a special, well kept home very close to the beach! We do our best to keep it in tip top shape for everyone. The grill is a standard propane grill. Will suggest a charcoal grill too! My family loved the house! Beautifully decorated, spacious and very clean! We thoroughly enjoyed the pool and the close proximity to the beach. Can't wait to vacation here again! So glad you enjoyed your stay at Cones Cove! 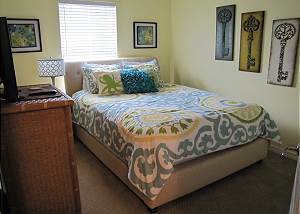 It is nicely decorated and well kept! 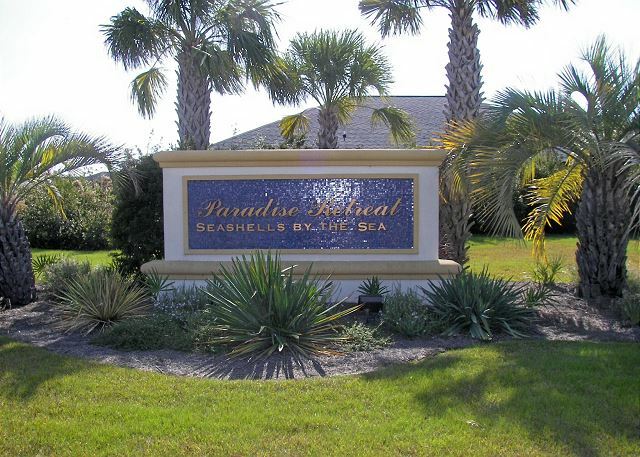 It is also very close to the private beach access and the private pool is very refreshing! 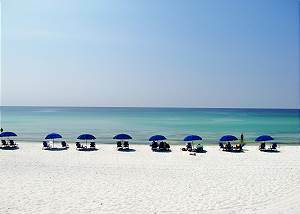 Stop looking for a rental in Destin. This is it. 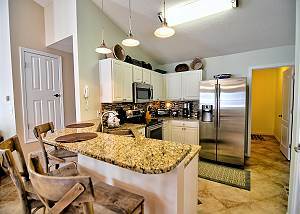 My wife and I, neither of whom had ever visited Florida, joined two of our best friends for a week's stay at this comfy rental on Sandy Cay in Destin. 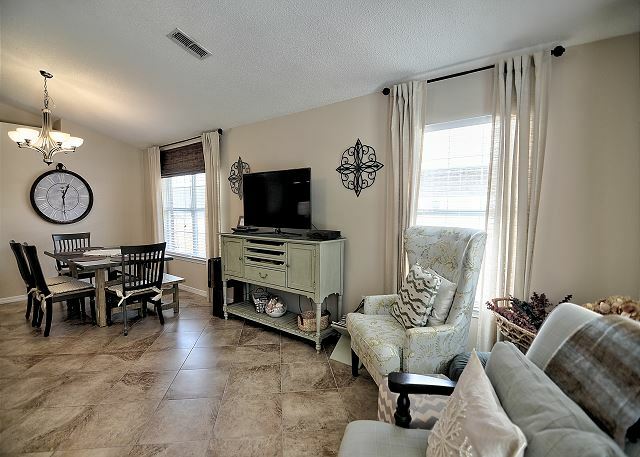 Having never rented from VRBO/Crystal Waters Realty before, we were just hoping the house, location and amenities were as good as advertised.And they definitely were. 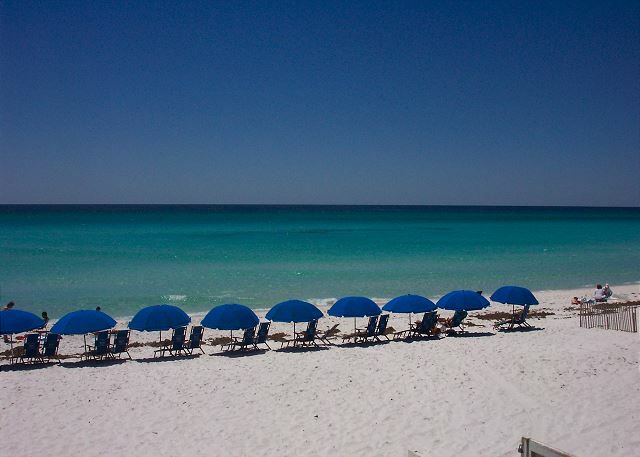 The location was almost perfect -- about two minutes from Destin's gorgeous white beaches. (I would have preferred a one-minute walk, but I'm kinda lazy.) The house was sparkling clean, well maintained and very well furnished. There were even some beach umbrellas, beach toys -- and a wagon to haul them to the beach -- in the garage, which was an unexpected but welcome bonus. The pool in the back yard was crystal clear, and we saw the pool maintenance person twice that week. The patio furniture was nice, too. It's a friendly, safe neighborhood and nearby residents were helpful with any questions we had. 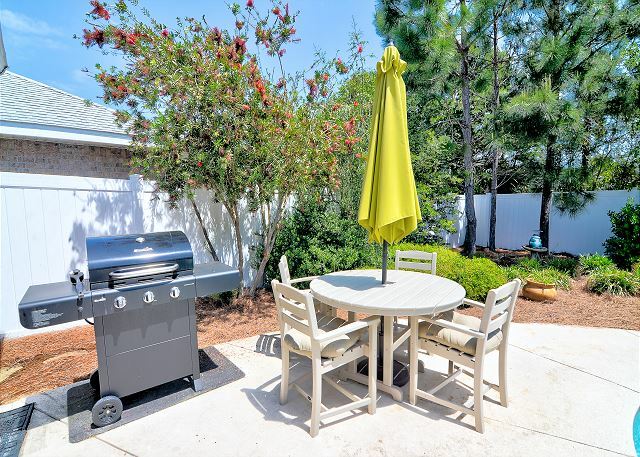 The back yard was a delight - well landscaped and maintained. We had a daily visit from a gorgeous cardinal and a few mocking birds (probably waiting to snack on the few lizards and frogs living there. )Just so you don't read this thinking someone from the real estate company wrote it, I do have a complaint. The knob on the deadbolt of the door leading from the kitchen to the garage fell off, and I didn't have an allen wrench to fix it. I'm sure it's been fixed since.The four of us had an awesome week in Destin, thanks in no small part to our super little house. So glad you enjoyed your stay at Cones Cove! 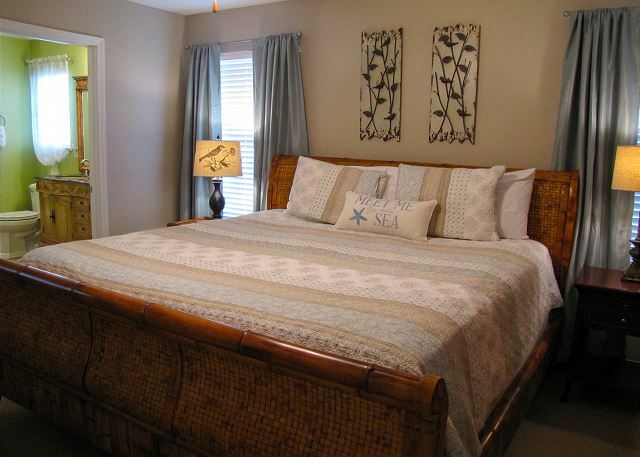 It is a super nice and well kept home very close to the beach! The private pool is an added bonus and so very refreshing in the Summer! Yes, the knob was fixed! The home was exactly as it appeared on line. Photos can sometimes be deceiving, but this house was great. 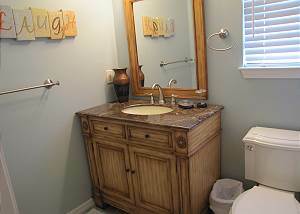 The house was spotless and has been well maintained. We were comfortable the moment we walked in. All appliances were new and there were plenty of cooking utensils. The walk to the beach was easy and the little wagon was a great help in hauling our stuff to the beach! I would definitely recommend this house! Management was also very easy to work with! So glad you enjoyed your stay at Cones Cove! It a special home that is always well maintained and comfortable for all! 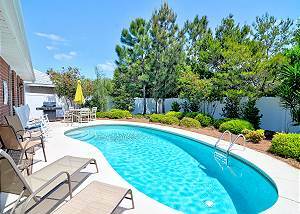 The private pool is refreshing and the private beach access very close! Awesome get a way spot!! So glad you enjoyed your stay at Cones Cove! It is a special home with very nice renovations! 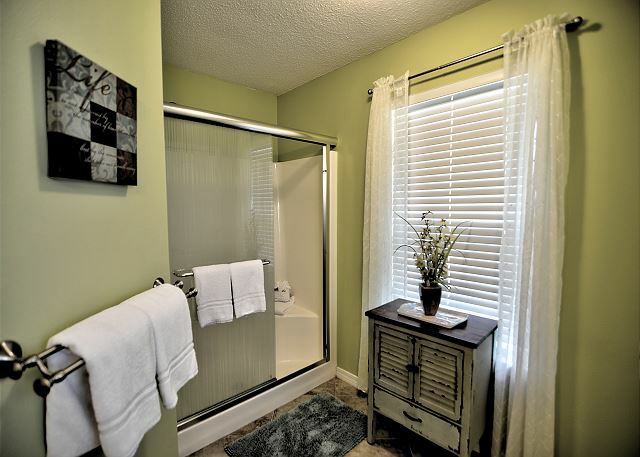 We do our best to keep it updated, clean, and comfortable for everyone.